Comments: In March 1832, the Scottsville Methodist Episcopal congregation purchased Lot 26 from Martin and Mildred Thacker for $150. This church property sat two lots east of Valley Street on the north side of Main Street and was deeded to the following church trustees: Lewis Mayo, Beverly Staples, Nathaniel Moon, Lelan Morris, Martin Tutwiler, Horatio I. Magruder, and William C. Adams. Shown in the above postcard is the original square church building completed in 1833. The Scottsville Sun, dated November 8, 1951, reported that the Methodist Church first belonged to the Albemarle Circuit, and its first pastor was Reverend Albert C. Burton. The first Methodist parsonage was purchased in 1885 through the efforts of Mrs. Zack Jones; a new parsonage was constructed in 1949 and is still in use in 2016. The first organ was placed in the church in 1885, and Mrs. Mollie P. Hill both helped raised the organ's purchase price and became the church's first organist. Prior to that organ, the congregation got their pitch from a tuning fork, and the hymns were sung without accompaniment. Over the years, flood waters from the James River frequently invaded the church. One Sunday, as a popular story goes, the congregation had just risen to sing "How Firm a Foundation" when the floor fell in. 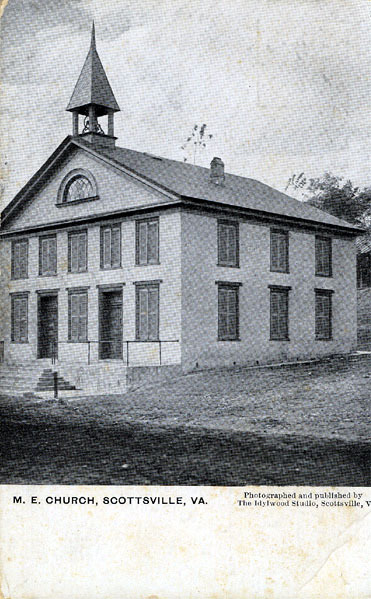 In 1927, the Methodist Church underwent extensive renovations that added 14 Sunday School rooms and a new front with bell tower as shown at right. The image below shows the Church after the 1927 renovations. An annex was completed in 1972, but the Methodist Church required extensive repair after a terrible fire in 1976. The Scottsville Methodist Church was originally called the Methodist Episcopal Church, but became a Methodist Church shortly after it was built in 1833. The lot upon which the Methodists first planned to build their church was on the opposite side of the street from where it now stands in the heart of Scottsville. That land was bought from Benjamin Childress and wife in 1828 and later sold. The proceeds were used toward the purchase of the present site, bought from Martin and Mildred Thacker for the sun of $150 and deeded in March 1832, to the following trustees: Lewis Mayo, Beverly Staples, Nathaniel Moon, Lelan Morris, Martin Tutwiler, Horatio I. Magruder, and William C. Adams. The original square building to which an addition has been made was erected in 1833. At that time, it belonged to the Albemarle Circuit, and its first pastor was Rev. Albert C. Burton, who had as his assistant, Rev. R. G. Benhett. The church later became part of the Scottsville Circuit when the Albemarle Circuit was broken up. After a quiet interlude during the War Between the States, when services became infrequent, Paul Whitehead became a regular pastor of the church. The present parsonage was purchased in 1885 through the efforts of Mrs. Zack Jones, who helped raise the money for the first payments. Also in 1885, the first organ was placed in the church, and Mrs. Mollie A. Hill was the first organist. Mrs. Hill was also largely instrumental in raising the money toward paying for the organ. It is recorded that previous to this time, the pitch was gotten from a tuning fork and the hymn sung without accompaniment. The church underwent extensive repairs under the pastorate of Rev. C.E. Blankenship in 1902-1906. Then in 1927-1928, the building was remodeled with a wing added containing 14 Sunday School rooms, a new front entrance and a bell tower. Among those who have served as superintendents are two, M. B. Harris and B. H. Jones, Sr., who served 25 years each and Peter V. Foland, who served more than 25 years. Present Sunday School Superintendent is George T. Omohundro. At present the church has a membership of about 350. The church serves the community not only as a religious center, but the school rooms are used for meetings of all kinds, for a nursery school during week-days and music lessons are given in the choir room. Mrs. T.E. Bruce is organist and choir director. Two charter members of the Woman's Society of Christian Service are still living. They ware Mrs. Hattie Moulton and Mrs. Jackson Beal. This organization is very active and contributes to both local and foreign missionary work and toward the upkeep of the church and parsonage. President is Mrs. C.W. Needs, vice-president is Mrs. Alvin Smith, and treasurer is Mrs. David Philpot. The pastor, Rev. Jack B. Taylor, has been here four years and came from Mecklenburg County. He has two sons, Robert and Beverly Files. The Methodist Youth Fellowship group meets every Sunday evening. Mrs. Campbell Holt has been their counsellor during the past year. A unique memorial gift which is enjoyed by the whole community is the set of Schulmerich chimes which reproduces carillon music from a loud speaker at the top of the tower. This was given by Mr. and Mrs. Sam Butler in honor of their son, Forrest Butler, who gave his life in World War II. Another memorial gift is the altar rail in honor of Captain John L. Pitts, a devoted member for many years. Most of the pews in the church were contributed by families in the congregation as memorials. The Scottsville Methodist Church has grown through the years and progressed along with the town. Its increased size and activities stand as a tribute to the loyal and devoted workers who have kept it thriving as one of the largest churches in the area. It was the year 1832 and the War of 1812 wasn't that long past. The country would not celebrate its centennial for another 44 years. Scottsville was doing rather well for itself. The town had recently grown with the annexed "Harrison Addition," a parcel of more than 20 acres, and the economy was booming. The road from Staunton to Scottsville had been completed in 1827, and the town, thanks to the James River, was the shipping point for goods produced in the Shenandoah Valley. It was around 1830 that religion seems to have taken a prominent place in the lives of the townspeople. Documents in the church indicate that the original church building was completed in 1833; see photo at top of this page. The original building was completed in 1833. The original building had walls made of brick some 21" thick. The square room had a balcony around three sides. And although the exterior was rather plain, the interior wood work more than compensated for the plainess of the exterior. The church originally belonged to the Albemarle Circuit. Records indicate that its first pastor was Reverend Albert C. Burton. There are few if any records of how the church fared during the War Between the States. It is assumed that the congregation met when possible at the homes of the individual members. We do know that in 1865 services resumed at the church, and the Reverend Paul Whitehead led the worshipers. The church has seen many ups and downs in its history. 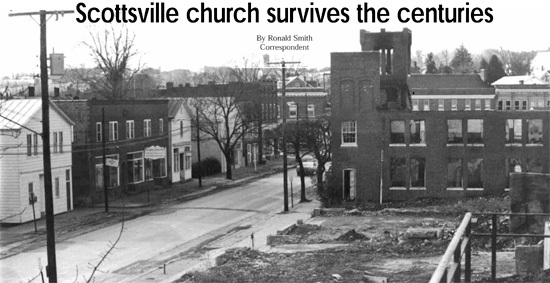 Flooding in 1869, 1972, and 1985 did extensive damage to not only the Town of Scottsville but also to the church. In 1985, the flood waters reached 33.6 feet, the same level the James reached in 1972 during Hurricane Agnes. In 1870 and 1969, water levels reached the second story windows of the town's buildings. After each of these disasters, the Methodist congregation, along with their families and friends, restored the church to a useful condition. In 1927, the bell tower was erected and a number of Sunday School classrooms were added. In 1960, the church's interior was redecorated. Memorials given to the honor and memory of members may still be seen today, such as the altar rail given in memory of Captain J.L. Pitts and the gold cross on the altar given in honor of Mr. Guy Moon. While natural disasters are bad enough, man-made disasters can be worse, mainly because you don't expect them. An approaching storm may provide a chance to deal with the inevitable, but something man-made, such as arson, strikes completely out of the blue. This is what happened in 1976. February 1976 was a particularly bad month not only for the church but for the entire town. An arsonist was on the loose. The culprit had set numerous fires around town, and when he decided to set the W.F. Paulett and Son building supply company ablaze, he succeeded in destroying the Methodist Church next door in the process; see photo of fire-damaged church building at beginning of this article. The church's minister, the Rev. H. Fred Edge, stated that although the monetary estimate of damages was around $225,000.00, "you can't put a dollar figure on the church. It was erected in 1833, and it is priceless." In 1968, the governing body of all Methodist churches merged with the Evangelical United Brethren. 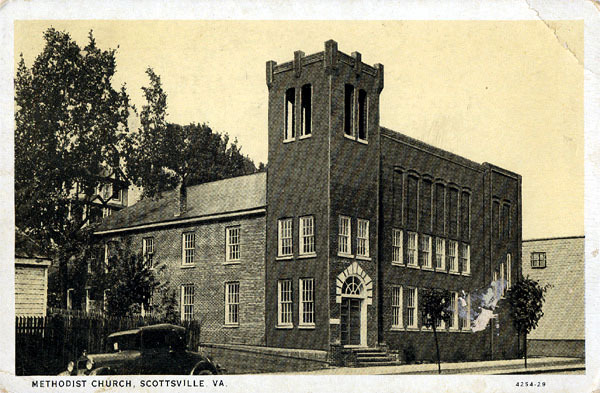 What began as Scottsville Methodist Episcopal Church then became Scottsville United Methodist Church and is today part of the Southern Albemarle Charge which includes both Scottsville UMC and Mt. Zion United Methodist Church. The pastor of both churches is the Reverend Bruce Lugn. Through all those years,, in both good times and bad, the church on Scottsville's East Main Street has survived. Whether enduring floods like Noah or rising from the ashes like the Phoenix, this congregation has proven they can not only face adversity, but they can survive!